Tour Melbourne's magnificent Bellarine Peninsula and the wild Surf Coast areas of Victoria, and explore Melbourne’s favourite summer playground on a relaxing ride. Take a day tour to Melbourne's glorious Yarra Valley with its magnificent valleys and vineyards, surrounded by national parks and State Forests. Tour and explore Melbourne by trike on this wonderful day tour that visits many of Melbourne's historic areas, as well as scenic historic, bayside, sporting and parkland locations. Tour Melbourne's glorious Mornington Peninsula and historic Point Nepean National Park, and take in views of Melbourne and Port Phillip Bay. 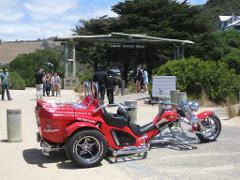 One of the great road tours from Melbourne, and one of the great motorcycle road trips in the world! This Great Ocean Road sightseeing tour allows you to get up close and experience sparkling surf beaches, cliff top views and winding roads.